Main Italian private television operator, with its millions of viewers daily and always vigilant about the evolution of the communication industry in the last years, which shows an always increasing and more dynamic technological assimilation trend and shows for a market between the telecommunication industry and the media industry. 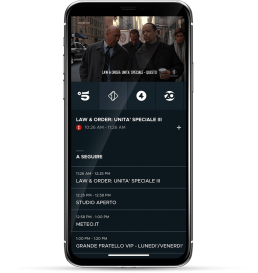 From this point, the need to create a media ecosystem characterized by a revolutionary and innovative system of consumption of multimedia content, the first OTT (Over-the-top) platform ever to be developed in Italy. 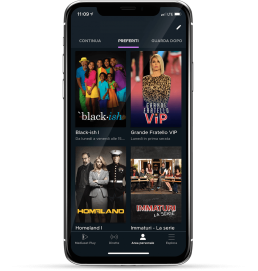 It is a new online streaming platform, that grants access via the internet to live and on-demand content, available on iOS and Android mobile devices and on a desktop website. One of the most interesting and innovative traits of the OTT Mediaset Play platform is its almost entire modularity. The instrument upon which the new digital Mediaset ecosystem is based allows configuring every single element. Every section of the app is easily transformable for what concerns the order, the structure of the information, the font, the pictures, and the colors. This is to facilitate the Mediaset team who can easily propose different content based on the marketing necessities, without having to involve the developers team every time. Another key element in realizing the project was the continuous collaboration among diverse teams spread across the country, often used to work methods and processes different among them. Many were the added functionalities, the channels live view and the Restart function, which allows for a live program to be watched from its beginning at every time. For a project this big, in which hundreds of thousands of user will use the platform, necessarily needs a testing session to verify that the vast majority of devices present on the market, will allow the consumption of the content, it being through tablet, iPad, smartphone, iPhone, different browsers and through different typologies of devices. Thanks to a tester community, we gave the chance to try the player functionalities before their release, collecting so precious opinions and bug alerts. A personal area that allows the user, once logged in for free, to save not only its favourite programs but also those who might be interesting to watch in another moment. New functionality is that of the “continue watching”, which allows resuming watching a video from the point where it was left off. After the first release of the new app, July 5th, 2018, the Rawfish team took care of the platforms maintenance and, at the same time, the continuous adding of new features. 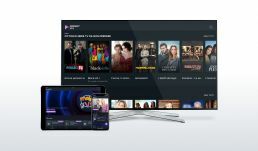 An example is the chromecast functionalities, not available in the first summer Mediaset Play releases, but introduced again in September. From a technological standpoint, the elements developed in react native and then, with runtime, redirected to the iOS and Android apps are surely interesting. To make a practical example: the widgets for the content articles and the in-app voting were realized in react native. The voting feature was introduced to engage even more with the users whilst watching a live TV show as, for example, the “Big Brother”. The content articles, on the other hand, allow the users always to be up to speed with its favorite programs and shows, without the need to watch the video content. Soon, it will be possible for users to have a customer care service directly in-app, with the goal of being as close as possible to the users.